Summary: This is a story told all in pictures about a dog and the ball she loves. This story, told solely in pictures, uses the illustrations to tell a story that may have been over simplified if words were used. The illustrations are done in what might first appear as childish paintings or even finger paint. The broad strokes make it easy to read Daisy’s emotions as they change with every turn of the page. This title won the 2012 Caldecott Award for best illustrated children’s book. Theological Partners for Conversation: Daisy teaches us a simple and timeless lesson about sharing, while also retelling the principles given to us in Luke 6:31. All children, it seems, are taught from an early age to share. It is something that is not easily learned for those of us who had fewer instances where sharing was even an issue, like us only children. Daisy doesn’t think she has to share. Unfortunately, during a trip to the park, another dog doesn’t give her the option and chooses to play with her ball too. As a result, Daisy uses poor judgment that ends up costing her dearly. As the story comes to a close, the other dog, who could easily see Daisy as an enemy, shows her instead what it is to “do unto others as you would have them do unto you” ( Luke 6:31). What does Daisy love? How does she show it? Who and or what makes up Daisy’s world? What happens to disrupt Daisy’s world? How does this make her feel? What happens when Daisy returns to the park? Who do you most identify with? Why? Where is God in this story? Can you see Jesus? Can you see the Holy Spirit? This review was written by Union Presbyterian Seminary student LaDonna Harrison. 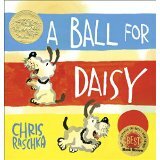 A Ball for Daisy by Storypath is licensed under a Creative Commons Attribution-NonCommercial 4.0 International License.